Published: May 18, 2016 at 11:55 a.m. Updated: May 18, 2016 at 02:52 p.m.
College Football 24/7's "16 for '16" series continues with a look at the 16 best college football players who bypassed a chance to apply for early entry into the 2016 NFL Draft. The Cougars star was tempted to make the NFL jump coming off a 104-catch season (1,192 yards, 15 touchdowns). 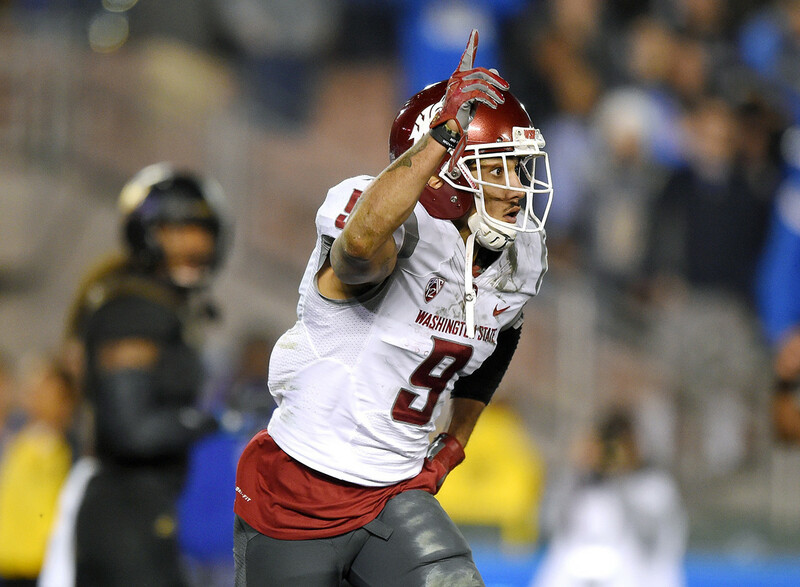 Instead, he'll team up with QB Luke Falk in an effort to once again to shred Pac-12 cornerbacks and show NFL scouts that he's not just a product of WSU's pass-happy offense. After a 3-9 season in which the Terrapins made a coaching change, it would have been understandable, if not expected, for Likely to make an early exit. Instead, Maryland returns an outstanding cover man (11 pass breakups last year) and one of the most exciting return specialists in the college game (17.7 yards per punt return in 2015). Although LB Jalen Reeves-Maybin might be the more valuable player to the UT defense, an NFC West scout told College Football 24/7 that Sutton is the better draft prospect of the two. He's built a strong career track record with 38 starts and 26 pass breakups at cornerback over three seasons. Though he's Tennessee's best defensive back, his punt-return skills (18.7 yards per return last year) make him a double threat. The Tigers' linebacking corps got a true leader back when Beckwith decided to complete his NCAA eligibility with one more season in Baton Rouge. The middle linebacker handles calls and checks on the LSU defensive front, which will be crucial in 2016 with a young group of linebackers around him. Beckwith is the team's returning leader in tackles (84) and tackles for loss (10). The Bruins' left tackle returns to lead a UCLA line lacking in experience, so his decision was of great importance for star sophomore QB Josh Rosen. The UCLA line allowed less than a sack per game last year, and McDermott's effectiveness on the left side played a key role in that. At 6-foot-9, he comes with all the length NFL scouts look for at the position. Williams was used as a DPR (designated pass rusher) at Alabama last year and excelled in the role with 10.5 sacks among just 19 total tackles in limited action. He returned primarily to prove himself as a capable run stopper and an every-down starter, a challenge that NFL scouts will closely monitor to assess his 2017 draft value. At 6-4, 237 pounds, he's undersized to play defensive end, so showing a wider range of ability as a linebacker will be important for his draft stock. Banner won the team's Offensive Lineman of the Year Award in 2015 as a dominant starter at right tackle who saw a bit of action on the left side, as well. At 6-9, 360 pounds, he definitely didn't come back to USC to get bigger. His season-opening performance against Alabama's Tim Williams and Jonathan Allen (listed here), good or bad, will be a go-to tape for scouts. A program known for having a sack master on the edge found another one last year in Walker, who delivered 10.5 of them among 15.5 tackles for loss and four forced fumbles. His return gives Jimbo Fisher a cornerstone defender for 2016. He'll test offensive tackles throughout the ACC this year and should garner heavy scouting attention. Even before Howard torched Clemson for 208 yards and two touchdowns on five catches in the College Football Playoff title game, he had received a second-round draft grade. With plenty of room to grow in an Alabama offense that forgot about him at times last year and for most of his first two seasons, Howard's production figures to climb in 2016. His blocking, once a work in progress at best, has improved. Playing for his third school in three years, Fields was outstanding for the Cardinals last season in making 22.5 tackles for loss -- including 11 sacks -- for an FBS-high 1.7 per game. He also needed a quiet year off the field given the circumstances under which he was ousted from TCU two years ago, and accomplished that as well. Fields had shoulder surgery in January, but is expected to be fully ready for the season as one of the nation's elite pass rushers. As nine Buckeyes underclassmen bolted for the 2016 draft, Elflein decided to stay. A two-time first-team All-Big Ten offensive lineman, there's little else for him to prove at the college level, except this: he'll switch from guard to center in 2016, giving NFL scouts a chance to evaluate him at a different spot. The Wolverines star returned to college with graduation as his primary motivation. Though small (5-10, 175 pounds), Lewis set a school record with 20 pass breakups on his way to being selected first-team All-Big Ten. Another year means another chance for Lewis to prove his size isn't a problem. With apologies to Tennessee's Joshua Dobbs, Kelly is the best returning quarterback in the Southeastern Conference. It would have been easy to come out with the best pass protector in college football (Laremy Tunsil) and one of its best receivers (Laquon Treadwell). Instead, Kelly returned to face the uncertainty their absence leaves behind. If you don't think scouts will have a close eye on White this fall, just rewind to NFL Media analyst Lance Zierlein's assessment of his skills going into last season. White followed that praise with a team-high seven pass breakups and now has 34 career starts to his credit. He can blanket his man in coverage and can handle the challenge of playing on the wide side of the field. King is the first Jim Thorpe Award (top defensive back) winner to ever return to college for another season. The consensus All-American picked off eight passes last year and was a dynamic punt returner as well. King will easily be the Hawkeyes' top prospect for the 2017 NFL Draft. Of Alabama's annual core of juniors that have an early entry decision to make, Allen's decision in January to stay was the most surprising of them all. He led the team in tackles for loss (14.5) and sacks (12), can play inside as a third-down pass rusher, and is generally one of the biggest headaches for offensive linemen anywhere in the SEC. Prediction: 2017 first-round pick.